A circle represents totality, wholeness and perfection. The Amish Ripple Back Round Convex Extension Table, with its rounded, convex legs provides a perfect circular design to add an edgy, modern look to your dining room. 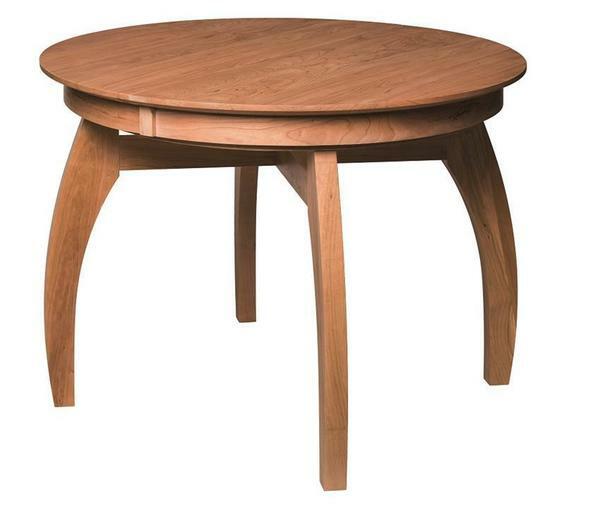 Simple and natural, this contemporary table brings a lovely form to your dining room collection. This round table is perfect for intimate dinner conversations, game nights and celebrations. The Ripple Back is shown here in solid cherry wood. Cherry wood furniture is elegant and strong and is a popular choice for solid wood dining tables. Curvy legs, a smooth, rounded top, and a leaf extension option make this table one that will fill many dining room requirements.